I shipped my 9-month-old MacBook to Apple for warranty repair on April 4. I received it back on May 7, only after calling them and demanding expedited service. They said they'd give me a replacement battery, since my battery's capacity was well outside their "normal wear and tear" range. The shutdowns and monitor recognition needed motherboard ("logic board" in Apple-land) replacement, and my computer sat in their warehouse for a month waiting for the motherboard to arrive. When I called last Friday, they said that this was normal, and it was going to be waiting for a few more weeks for another part. I complained enough that the unfortunate tech issued a special request to put my computer at the front of the line. It shipped out the next morning. I finally got it back yesterday with a brand new motherboard, a reseated backlight cable, and... the same useless battery. Thanks a lot, Apple. After over a month of waiting, I got a half-repaired computer. They had also left black, sticky residue on the exterior, possibly from an inventory sticker. This was particularly annoying, as I keep my laptops very clean, and I would expect Apple's usual attention to detail and presentation. Fortunately, Tekserve was happy to replace the battery that Apple forgot. It took about 10 minutes. Tekserve is awesome. But the service from Apple was appalling. How long would it have taken if I hadn't called and complained? Does Apple really believe that it's acceptable to keep people's relatively new computers for over a month during routine repairs? I've confidently recommended Apple's products to clients, friends, and family members. By endorsing their products, I'm assuming a risk: if someone has a bad experience with a product I recommend, my reputation with them is diminished. I can no longer say with certainty that I'd recommend Apple's laptops to everyone. 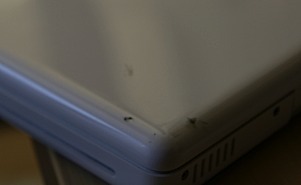 My old Powerbook G4 was rock-solid. It was much slower than the Intel Macs, but it worked flawlessly under very heavy use without any hardware problems or glitches. I never had to send it in for repairs. My experiences with the MacBook and MacBook Pro have been very different. The Intel switch has brought much faster, more versatile, and cheaper computers to Apple's lineup. But the hardware is still very buggy, and the failure rate is unusually high. As much as I like Apple's products when they work, their support was awful. I never thought I'd say this, but I'd rather deal with Dell. You won't understand a word of it, and you can only communicate effectively via email, but Dell's support will make absolutely sure that you have a working laptop back within a week. Come on, Apple. Hold your repair centers to the Apple standard and fix this process. You're having serious quality control issues. And please never make me complement Dell's service again. I wrote this article last night and published it just after midnight. My MacBook woke up this morning from sleep and promptly had a kernel panic (the OS X equivalent of the Blue Screen Of Death, except it's gray and translucent). A few minutes into the next session, it rebooted itself for no apparent reason. And it's on external power, so it's not a battery issue this time. It's going back to Apple again. After a month of waiting, they gave me another faulty motherboard. I feel sorry for the tech who takes my call in a few hours. I sent it back on May 9, and the tech told me I'd be assigned a senior support agent to watch my case and call me with updates. That never happened. As soon as they received the computer, it went straight to "On hold - Part on order" status again. On May 16, I called again. The agent very nicely told me that there was absolutely nothing she could do to speed it up, so I asked if anyone above her could help. I don't know why I didn't ask earlier, and I imagine they aren't supposed to volunteer that information. I was transferred to Matt Dunn, a Product Specialist. He looked at my case and immediately apologized, saying that it was "embarrassing" and it should never have taken this long. He immediately offered to cancel the repair and send me a brand new replacement MacBook, which I accepted. The replacement is the newest model (Core 2 Duo with 4MB L2 cache) with equal upgrades as my old MacBook. It's about 10-20% faster with the new CPU, and it came with everything that every Mac comes with (including another power adaptor) in a brand new box. Matt says that it's treated like a brand new Mac and has its own newly issued serial number, which has one very nice side effect: the 1-year warranty starts from today, not from the original purchase date. So in exchange for my great inconvenience, I get my 11-month-old laptop replaced with a brand new, slightly upgraded model with another year of warranty coverage. I received it today, May 22. Everything is working perfectly so far, even in my demanding 24"-monitor-span setup at work. Hopefully I won't have to update this article again. I'm disappointed in how long this took, and how the service I received was abysmal until I complained enough and asked the key phrases to get them to send me a new one. I'm very satisified with the way Apple rectified their poor initial service for me. And I'm better off with a new laptop than I would have been with a fixed old one. I just hope that as few people as possible are subjected to the first half of my story without getting the second.